Discipline, Honest and Integrity, Loyalty, Determination, Courage, Respect for Self and Others; these are the core values of the Barbados Defence Force and formed the bedrock of the Chief of Staff, Col Glyne Grannum’s address to the 53 Regular and Reserve recruits who passed out from training on Saturday 6 October 2018. 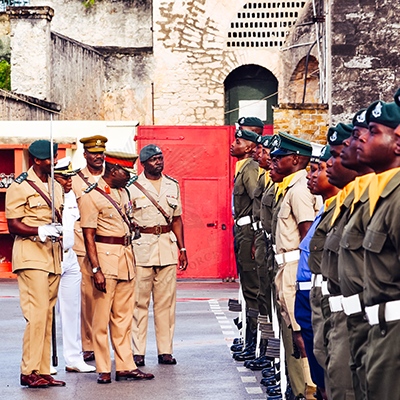 The Pass Out Parade and Sunset Ceremony was the climax of 21 weeks of arduous training for the recruits and marked their point of transition into the ranks of the Barbados Defence Force. The Parade was held at the St Ann’s Fort the Garrison Saturday 6 October 2018, to an appreciative audience of family and friends and receptive Command and Enlisted ranks. Chief of Staff Colonel Glyne Grannum inspecting the Recruits.